Some computers may need to disable acpi to install/boot Ubuntu OS. To install ubuntu, you can select the option acpi=off when booting with the live cd. This simple tutorial will show you how to disable acpi after installed ubuntu. 1. Start your system and wait for the GRUB menu to show (if you don’t see a GRUB menu, press and hold the left Shift key right after starting the system). Now highlight the kernel you want to use, and press the e key. 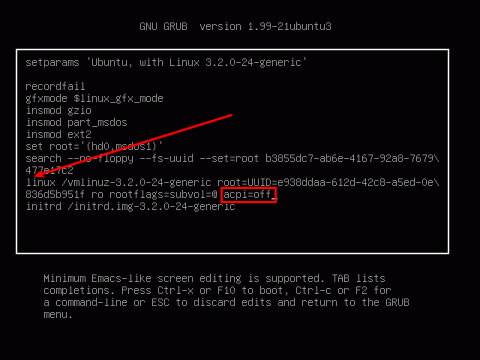 You should be able to see and edit the commands associated with the highlighted kernel. Go down to the line starting with linux and add your parameter acpi=off to its end. Now press Ctrl + x to boot. On the next reboot, the kernel should be started with this boot parameter. No user responded in " Turn Off ACPI while Booting Ubuntu via Grub2 "